Robots and androids have been present in myths and literature long before they became a concrete possibility. Now that it looks like androids may become part of our everyday life, popular culture is picking up this thought and imagining challenges which such a cohabitation may represent. The cultural imaginary – particularly as it expresses itself through film - is full of good robots, bad robots, evil cyborgs, good cyborgs and of bad humans who have treated androids badly. Whenever a robot or an android appears in a film ethical questions are never very far: questions of how they are to be regarded, how they should deal with us and how we should deal with them are at the core of the robotic plots. While Japanese and more generally eastern culture has shown a more positive attitude towards androids and a possible cooperation between humans and androids, western culture seems to suffer from the “Frankenstein syndrome” that is a scepticism or even outright repulsion towards one’s own artificially created beings based on the feeling of guilt. 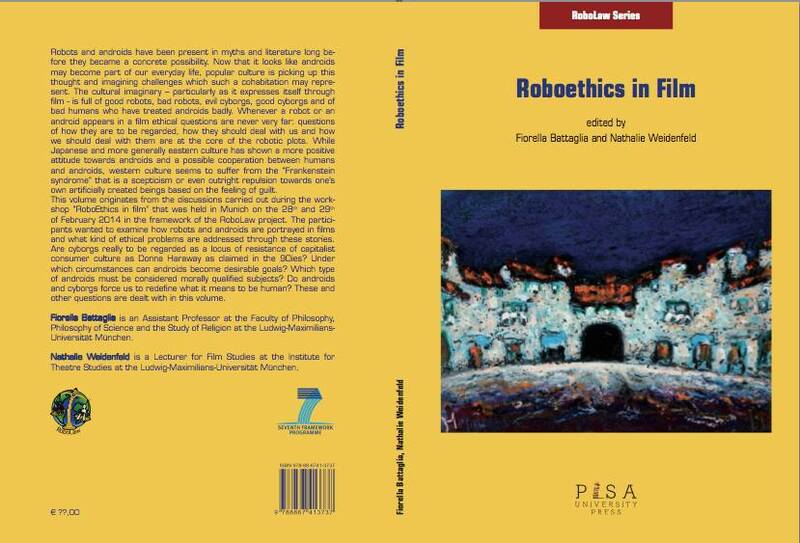 This volume originates from the discussions carried out during the workshop “RoboEthics in film” that was held in Munich on the 28th and 29th of February 2014 in the framework of the RoboLaw project. The participants wanted to examine how robots and androids are portrayed in films and what kind of ethical problems are addressed through these stories. Are cyborgs really to be regarded as a locus of resistance of capitalist consumer culture as Donna Haraway as claimed in the 90ies? Under which circumstances can androids become desirable goals? Which type of androids must be considered morally qualified subjects? Do androids and cyborgs force us to redefine what it means to be human? These and other questions are dealt with in this volume.